University of Nebraska-Lincoln students competed at the American Forensics Association’s National Individual Events Tournament, held at the University of Alabama, April 5-7. Students competing were (back row, left to right) Wesley Deuel, Kailynn Jensen, Ben Czapla, Jack Militti, Clinton Lowe, Cole Shardelow, Sydney Brun-Ozuna, , Madison Imig, Jennica Boardman, (front row, left to right) Batool Ibrahim, Tyler Walvoord, Tuner Jensen, Becca Human, Tiana Rasmussen, Mia Virgillito, Clare Frances Kennedy, Kendra Quiroz and Madison Morrissette. 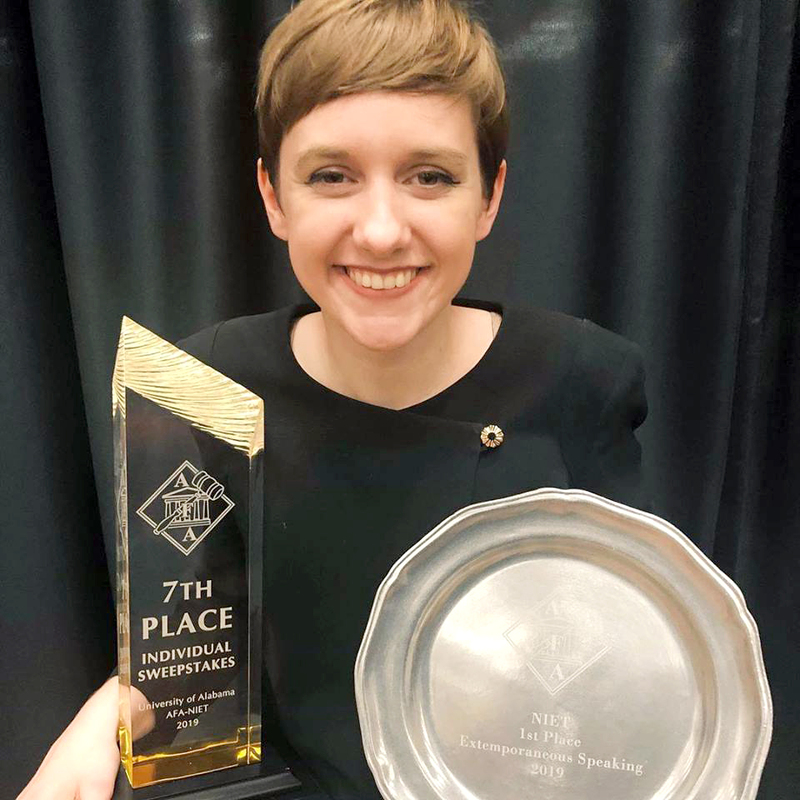 Nebraska's Becca Human made history by winning the University of Nebraska–Lincoln’s 10th individual national championship in speech in the team’s 148-year history. She was also named an all-American. Human, a senior English and political science major from Gretna, won the national title in extemporaneous speaking at the American Forensics Association’s National Individual Events Tournament, held at the University of Alabama, April 5-7. Husker speech students placed eighth overall in the national tournament, which featured 60 schools and 500 students. With this win, the speech team placed in the top 10 for the 11th time in 12 years and in the top 20 for the 24th straight year. Students in the final round are also subject to three minutes of cross-examination from a fellow contestant. In addition to winning extemporaneous speaking, Human placed second in impromptu speaking, fourth in persuasive speaking and seventh in the individual sweepstakes. At the opening ceremony April 4, Human was one of 12 students in the nation named to the National All-American Team. The Husker team had three students place in the top 10 in impromptu speaking. Along with Human, junior Madison Morrissette of Omaha placed fifth in impromptu speaking, and freshman Clare Frances Kennedy of Nashville, Tennessee, placed ninth. Only the top 10 percent of student speakers nationally qualify to compete at the national tournament and only the top 15 percent of those students advance to elimination rounds. Eighteen Huskers qualified for the tournament in 58 events, and four students advanced to elimination rounds in nine events. “Becca competed against the top speakers and thinkers in the nation. In the final round, she faced off against competitors for the University of Texas, University of Alabama, Bradley University, George Mason University and last year’s defending national champion from Northwestern University,” said Aaron Duncan, speech and debate program director. “Her final-round speech required her to synthesize and process information about the domestic situation in Venezuela, the United States’ involvement in the region and Russia’s political relationships with both countries. Human is planning to attend law school next fall. She has been accepted to law schools at Harvard University, the University of Chicago and the University of Virginia. Learn more about speech and debate and other opportunities in the Department of Communication Studies.